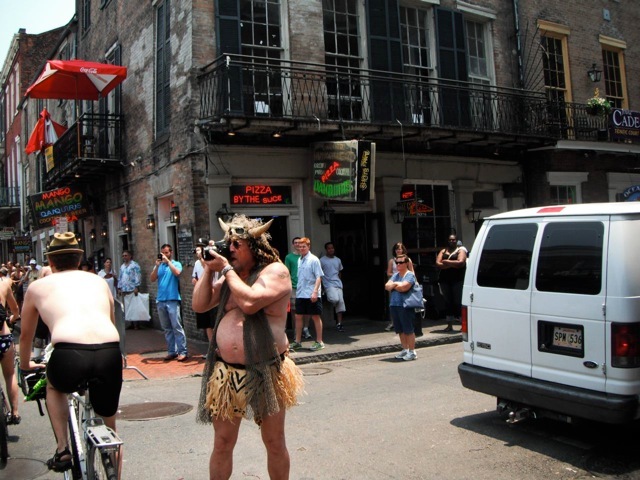 This past weekend, New Orleans hosted it’s 3rd annual World Naked Bike Ride. Gambit plugged it on Thursday and used the video of the inaugural ride I shot on my bike-mounted camera in the article. Editor’s note: Sorry about the confusion as to where the ride started. I had read that it would start at the same location as the previous two years – Washington Square. Upon arriving and seeing nobody, I learned the meetup had changed to Markey Park in the Bywater. Just as I parked and yanked the bike out of my truck, I could see the ride was starting. I stripped down and pedaled into the crowd just in time to get to the first bottleneck. Don’t know if the change in start location helped with the turnout. I’m guessing it was probably around 300 or so people. 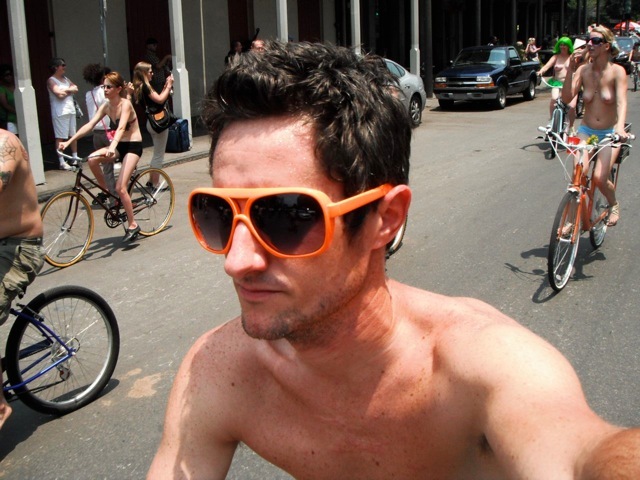 When it’s crazy hot in New Orleans, riding naked(or almost naked) is pretty damn comfortable. I like riding past hotels and restaurants in the Quarter and feeling the cold AC rush out on my skin. Camera in one hand. Steering with the other. Tall bikes. Bywater is and endless resource for tall bikes. We cruised down Decatur, where crowds of tourists video’d us on their cell phones. 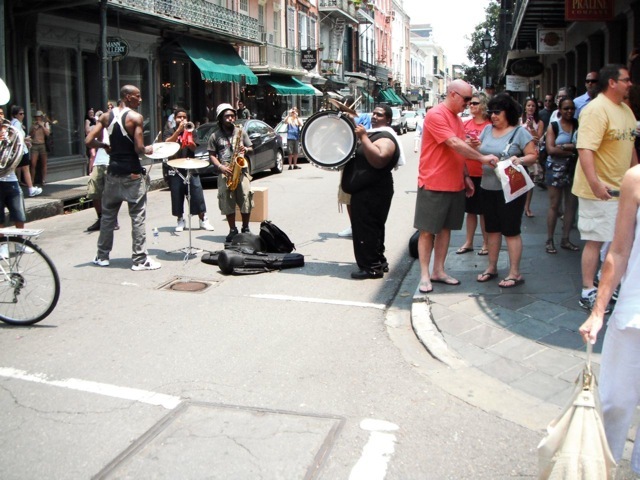 Next, we plunged into the French Quarter and crossed Royal St. where a brass band was playing to accompany our ride. Several participants pulled over to snap some shots of the makeshift parade. I think the razor scooter dude’s scrot is hanging out of his Speedo. Afterwards, the new location of the start/finish at Markey Park seemed like a pretty good idea, as most of the riders went to cool off by going swimming at Bywater institution, The Country Club. See you next year. Speaking of naked bike riding, I promised my friend Mari that I would plug her friend’s organization Loving Day. They are having and event here in New Orleans. Sounds like a cool movie and organization which has a presence in New Orleans until 6/26.